Optimize your foundation's donations and simplify collecting membership fees. Easily manage your foundation and your operating budgets through a single platform. Watch your member's complete life-cycle as they transition from active members to alumni donors. Allow anyone to easily donate to your foundation with a one-time donation or set up recurring donations that fit their budgets. Each donor will have a profile in which you can make notes, add custom fields, and set up reminders to reach out at specific times, on their anniversary date for example. Maximize your efforts by reaching out to the most valuable donors who haven't donated in a while. We'll help generate that contact list for you! 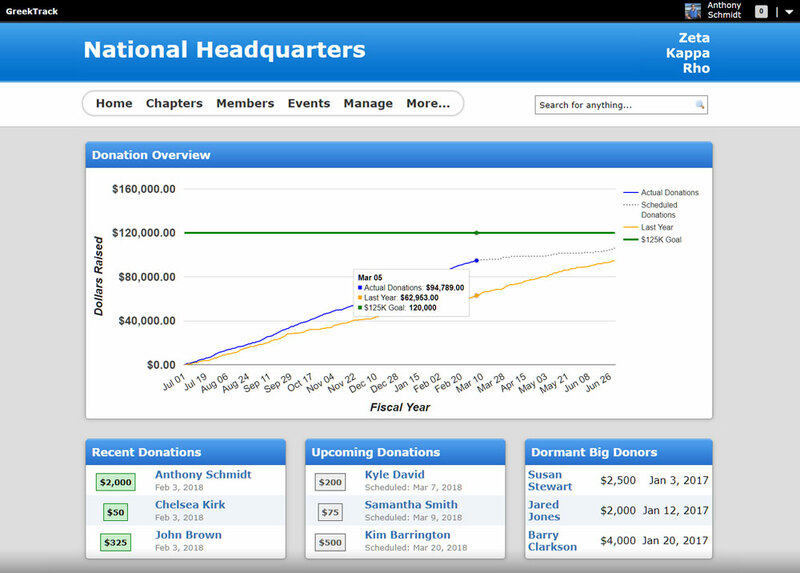 No more need to invoice your chapters! Instead simply set up a deadline and wait for the money to roll in. We already know how many members they have, so they'll just be reminded to pay on time automatically. One-time invoicing is also available with GreekTrack. If your national office sells supplies or merchandise directly you can easily submit an invoice to a single chapter to collect payments online. Since all of your chapters and staff are on the same platform, everyone is aware of each chapter's good standing. If there's an outstanding invoice local staff can help remind chapters without using national office resources. Chapters can also set up their own fundraising pages to benefit a local cause or even their own chapters.